This morning, I got around to making pumpkin coffee cake for breakfast. It's a recipe I found in one of the many, many, many collections I've collected over the years. This one is from Quaker Oats. I've had the ingredients for over a month but not the oomph to make the dish. Last night, I set everything out. The smell as this was baking was heavenly; toasted oatmeal, pumpkin, spices. The directions were to spread the batter in a 9 x 13 pan and I would have bet you $5.00 that this limited amount of batter, stretched thin over the pan was going to burn. It did not. It puffed up golden and wonderful. This is going to be an excellent complement to whatever I decide to take for lunch over the next week and as a snack. But what vexes me is you only use 1 cup of pumpkin. Pie and muffins are the same way. You've read the size of a "standard" can of pumpkin. A cup is 8 ounces. 15 - 8 = 7, less than a cup. I don't have recipes that call for less than a cup of pumpkin. If I make half of batch of pumpkin muffins, that's half a cup of pumpkin. I still have some left. There must be a reason pumpkin is packaged in less than ideal for cooking cans. Perhaps it's the size of the can. If it were a full 2 cups, or 16 ounces, it would take up more shelf space. So, what do I do with the extra? I could put plastic over the top and stick it in the fridge, but what will happen is that it will get moldy or hard and I'll wind up tossing it. I guess I'll add it to the materials destined for the compost heap, then rinse and recycle the can. 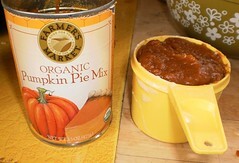 I wonder if any company has tried to market one or two cup cans of pumpkin puree. It would take a bit to ween consumers from this standard size, which has been around as long as I can remember. But it seems to make sense. If you need one cup, why are we buying 1 and not quite another only to toss the not quite?